I made this cake for a girl's 2nd birthday party. This was a very involved cake!!!! 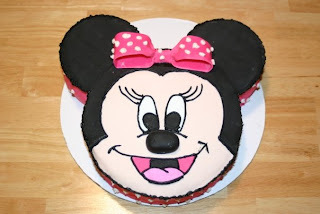 The face is made of regular cake, and the ears are made of chocolate cake that is egg and nut free. This cake is double layer, and is the equivalent of 2 cake mixes. You can order this cake for $75. 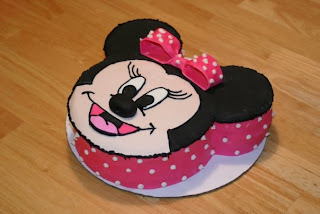 I can make variations including the color of fondant or even to turn her into Mickey Mouse.